Siamand Moeini a Council Member of the Free Life Party of Kurdistan (PJAK) in an interview with Akhbare Rooz News Agency: The political, social and democratic struggle of PJAK has been neglected. What is going on in Kobanê? This was the first question we discussed in meeting with Siamand Moeini and Shirzad Kamangar two council members of the free life party of Kurdistan PJAK. They were happily talking about Rojava, Cantons, people’s democratic participation in administration, Kurdish fighter defiance specially the historical role of women warriors in the definition and resistance of Kobanê and throw out ISIS fighters of this city. Kobanê where the heroes showed up and the facts found. Question: What is the stage of the battle against the forces of the ISIS terrorists in Kobanê? Answer: As you know, After ISIS brutal attack with support from some hegemonic political forces in the region, planning to occupy Kobanê, stifle people’s democratic gains in Rojava from a very beginning, in the face of this, people’s defence forces with strong willpower protected all the achievements and threw out ISIS. At the moment the People’s Defense Units, YPG are cleaning the villages and all the areas of radical Islamic forces. Q: what are the message and the outcome of Kobanê sustainability for Kurds and the region forces? A: Kobanê just not belong to the Rojava, but it is a freedom symbol and became the people’s will and resistance. Kobanê resistance has a message for all hegemonic involved in the conflict of the Middle East and fanatics if Kurdish people pioneered the process of seeking freedom in all stages and will never let the freedom seekers to shake down. Kobanê is an alliance sign of united nationalities, according to the difference community is to reach agreement. In Rojava the system of Self-Rule is based on the pragmatic of the leader APO “Abdulla Ocalan” which already has been practiced in Cantons from different strata. As you also knowledge that women’s role of scouts in Cantons and specially their resistance against ISIS are all adapted from this philosophy. Q: Kurds besides competing together in Iraq, in the fight against ISIS they are side by side with coalition forces, meanwhile they do not identify the Kurdish nation and its people, how far Kurds future has been assigned to the current conflict in Iraq? A: If you see the Kurdish people and the other oppressed people have never had an offensive plan in mind. Kurds have been a victim of Nation-State mentality and offensive. Due to the Kurdish weakness of being organized they not been able to defend themselves against their attack, but now we are on the verge of beginning of throwing down this system and Kurds are prepared for any confrontation. ISIS will not be able to undermine Kurdish will. The future of Iraq depends on the political system in Kurdistan’s management. Will and resistance in Kobanê is a sign of a particular world view and philosophy that can be a template for the Middle East in the future. A symbiosis of the united nation and respect for the rights of others with having all difference is the perfect model. The current system of Kurdistan’s leadership in Iraq is not responding to the will of free Kurdish people and their request. It is the bourgeois system and the experience of Sinjar “Shengal” proved that this system in critical condition and will not be able to protect the achievement of people, we saw that how this city was left behind defenseless in ISIS attack and causing the massacre of thousands of Shengal citizens and brought tragedy for humanity. Q: Introductory meeting of holding Kurdish Nation’s Congress, which PJAK believes Abdullah Ocalan (Leader APO), is the innovator of it, by calling Masiud Barzani leader of the Kurdistan Democratic Party climate leadership in Iraq, held on 14 March in Erbil. In this meeting 39 representatives of parts and Kurdish community from four countries such as Iran, Iraq, Syria and Turkey participated, a delegation of 21 members of congress organizers was chosen and as well as the date of the congress was set. In the Erbil introductory meeting three parts of Kurdistan of Iran such as Komale, democratic parties, PJAK and a few other small parties were joined. In between of total parts and Iranian Kurdish organization five people were picked and also one or two logistics meeting were held, but with the rise of the Islamic state in Iraq and their attack to Kobanê, Kurdistan subject became an international matter but it wasn’t as participants were expected. Do you still follow the Kurdish national congress? Is the recent meeting of Iranian Kurdish party’s representative with Nechirwan Brzani the Iraqi Kurdistan prime minister can make the distance between Kurdish members of national congress? A: As you mentioned, introductory meeting of holding Kurdish Nation’s Congress, is done and representatives of parties of four parts of Kurdistan were joined Kurdistan national congress is a long term project that wants to guide all Kurdish forces and associate them to their fate, but some groups who want to lead a region with feudal mentality and retarded leadership, are in conflict with democratic mentality, They want to practice their authority on other which will not be accepted so this is one of the factors to the failing of this project but not existence of, and attack by ISIS. Q: After the PJAK fourth congress and the Kurdish conflict escalation with ISIS terrorist, PJAK presence in Iran is not about having a reaction by Iranian media, especially the Iranian national media. Is that because haven’t your actions been paying attention by the media or your mobility has been diminished? A: The fourth congress was in line with our target and within PJAK scouts the “Free and Democratic Community of Eastern Kurdistan” KODAR was established at that time. In this regard, we prepared our self for conflict with the dictator system in Iran. The Iranian media have not taken any responsibility for reflecting Kurdistan news and sell down Kurdistan news, in the meantime, after the Fourth Congress our activities were mostly about the ideological and political organizing of the people’s forces and political dimension. Unfortunately, Iranian media’s misinterpret and wrong view of Kurdistan struggle, especially PJAK which as the only military force and neglecting the other dimensions of political, social and democratic struggle. Q: Mr Rouhani in the beginning of the months when became president, authorized Ali Yunesi as a special assistant on matters of religious and ethnic minorities and religious minorities, he tried to show that his government has special attention on the issues of nationalities in Iran. Since Rouhani been president, have you seen any progress of political management, safety condition or dealing government with people? A: After Rouhani became a president, in those early he tried to show up different faces of himself to fooling people, but he detected his reality face soon as he authorized Ali Yunesi as special assistant on the matter of religious minorities, religion and issues of nationalities which has safety background. Rouhani has no ability in this case and cannot find a solution. Nationalities and religious minorities are democratic principle and these matters will not be solved with frauds, vows and promises. During Rouhani’s administration, executions increased and secure conditions risen, particularly in Kurdistan and Baluchestan. They have forced liberals to be shut up in death. Macro policy about Kurdistan is security policy and decision of the Iranian nations is beyond Rouhani’s authority. Q: Autumn this year Alawi the minister of intelligence of Iran attended the parliament, he talked about the conversation between this ministry and Kurdish Democratic Party and Komale party. In response to the minister of secretary speech, Mr Khalid Azizi the Kurdish Democratic Party leadership noted: Islamic republic requested us to share our analyzing in relation to Kurdish issues in Iran. In our second session we offered them our proposed solutions. Kurdish KOMALA Party denied security parliament professes in his announcement and notified: we are opposing with any one-way meeting between Iranian Kurdish parties and Islamic republic of Iran and believe that cause the Kurdistan movement detriment and democracy. Do you also have been referred? What is your analysis about this regime politic that is having conversation with some communities about the harsh suppression of civil activities and political activities in Kurdistan? A: We do not discuss or negotiate with the Islamic republic of Iran. The other Parties discuss based on their own policy. We believe that none of Kurdish parties have the legitimacy to negotiate or discuss about Kurdistan on their own and in this case the alliance and representative delegation is necessary. Islamic republic of Iran’s has not been changed. For the root solution of Kurdish issues and other Iranian people must first put aside authoritarianism and acting up a democratic solution. The policy of exclusion and dissension between political groups, the demand of the Iranian nation will not be solved. 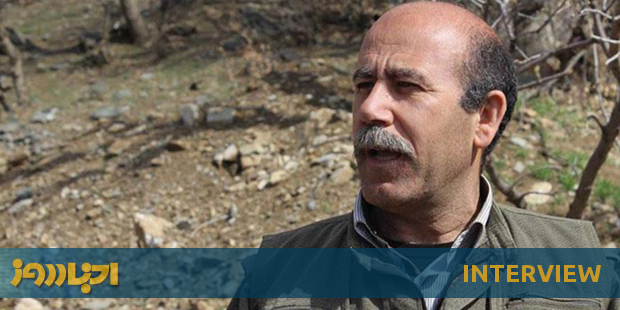 Q: Some media have interpreted the recent interview of Abdulrahman Haji Ahmadi the secretary general of PJAK to say that the Islamic republic is not changeable and also PJAK’s statements in response to the regime artillery attacks on the Kurdish area border and these are a kind of threat as military action by PJAK. How far this impression is close to your policy? Q: Early spring last year after the fourth congress of PJAK, a new political entity called ‘’Free and Democratic Community society of Eastern Kurdistan’’ KODAR was created by members of the initiative and participation of PJAK. At that time PJAK was described as an opportunity answer to militarization politic and historic, in what stage is your project? A: KODAR has been proposed as a democratic system for eastern Kurdistan “Rpjhelat” and at the same time it is a variant of the democratic solution which is based on people’s attitudes and self management in the community. KODAR has started at the beginning of its political life and to get it practical, mentality context is necessary. The current type of this system needs intellectual work in the community. At the current stage in Kurdistan, condition of appropriate fields has been provided. Q: In more than ten cities of Iran daily, there is political and guild movements of workers, teachers, women and the other segments of society, where your support of these struggles takes place? Basically the global campaign in Iran about PJAK strategic and politic which predominantly known as the force of the Kurdish people’s nation rights, what is its position and importance? A: PJAK sees itself as supportive of any kind of democratic movement in the community and giving hand and helping the various forms of possible and accessible. Iran’s ruling system is undemocratic and oligarch and it is in contrast with any liberator thoughts and does not tolerate of any freedom movement and democratic. In light of this fighting style, organizing groups and workers and guilds movement in this situation need right tactic. At the PJAK’s fourth congress diplomacy is based on relationship with people and global campaign. For PJAK in this context is a fundamental principle of struggle. In this direction we desire to help all organizations and political parties and democratic associations beside we attempt in this way. Q: PJAK introduces itself following the idea and politic left. Where do you place this idea in your policy? What are you doing to do in order to strengthen the left’s dialogue and politic in Iran? A: PJAK is a political and secular organization and the self management system and democratic confederalismis based on the same equality and community of society. We see our self as a follower of Leader APO who has socialist spirit and fundamental. Classic left after the collapse of the eastern block and socialist realism and marginalisation of socialist tribe has experienced a kind of personality crisis and somehow it forgot its role in fighting against imperialism and reactionary. A type of opportunity politic and liberal attitude in different forms has been replaced of radicalism and the revolutionary spirit. Not to be forgotten that against left group the Islamic republic of Iran’s role of the brutal and destructive in Iran is in a process of weakening them. The mission of the left group on the basis of axis for equality and left group roll is synchronized with society progress and freedom and democracy. We are behind of any progressive organization that is attempting for freedom and equality of society and we cooperate in this regard and we already have taken steps. Q: What do you expect of left groups and Iranian democratic parties? A: Any progressive organization and democracy in Iran has historical responsibility that should not stay silenced against oppression and tyranny. Convergence and tolerance are necessary fundamental and condition of robust fighting rank in Iran. The true forces of democracy and left groups is when it finds the real meaning of a democratic concept and also accepting the difference in principle of the fight. In line of the leading fighter to be diligent for the grand purpose of human being, in the field of fight, activate a type of pacifism in the practical struggle. We expect the left and democratic forces in Iran to proactively support the Iranian people’s desires and their campaigns and also they keep up with us in a target against tyranny in the form of practical and activated. In the current situation create a radical left is historical necessity and the lack of radical left in Iran will provide opportunity to chauvinism and fanatical forces to be growing up and pulling Iran backward.